A woman of generous character will sacrifice her life a thousand times over for her lover, but will break with him for ever over a question of pride. Indeed, man has two different beings inside him. What devil thought of that malicious touch? Faith, I am no such fool; everyone for himself in this desert of selfishness which is called life. A novel is a mirror which passes over a highway. Sometimes it reflects to your eyes the blue of the skies, at others the churned-up mud of the road. The first characteristic of Rossini's music is speed — a speed which removes from the soul all the sombre emotions that are so powerfully evoked within us by the slow strains in Mozart. I find also in Rossini a cool freshness, which, measure by measure, makes us smile with delight. After moral poisoning, one requires physical remedies and a bottle of champagne. The great majority of men, especially in France, both desire and possess a fashionable woman, much in the way one might own a fine horse — as a luxury befitting a young man. Wit lasts no more than two centuries. At La Scala it is customary to take no more than twenty minutes for those little visits one pays to boxes. A novel is a mirror that strolls along a highway. Now it reflects the blue of the skies, now the mud puddles underfoot. It is from cowardice and not from want of enlightenment that we do not read in our own hearts. 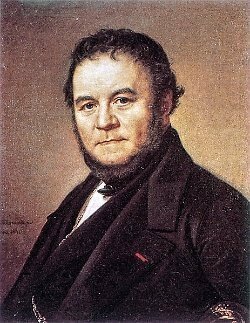 Bio: Marie-Henri Beyle, better known by his pen name Stendhal, was a 19th-century French writer.